3++ is the new black. | Kirb your enthusiasm! : Comparison: The Weapons of 6th? Comparison: The Weapons of 6th? With 5th edition fast fading into obscurity behind us, the main question is what will become the heavy and special weapons of choice for most armies? Considering the majority of armies out there use a basic Imperial weapon system and most of the recently released armies are based upon this paradigm, we can look at some of the more common weapon loadouts and make some generalisations across armies. For example, 5th edition was all about the meltagun, autocannon and missile launcher. Not 100% accurate but seeing those types of weapon loadouts across from you (and their non-Imperial equivalents) wasn't uncommon. The autocannon brought rate of fire and a good medium strength combination - this allowed for easier suppression against vehicles. Missile launchers, particularly in groups, brought that extra strength to cause instant death against T4 multi-wound models, damage AV12+ more reliably and bring some anti-infantry in the case of small blasts. Other options like the lascannon, heavy bolter, etc. were left in the dust due to being too expensive or too ineffective against vehicles. Have things changed? Yes and no. Autocannons are still an excellent choice, especially in they can be twin-linked like in Imperial Guard Heavy Weapon Teams or Space Marine Dreadnoughts. They were suppression machines before, now they are hull point eating machines. They're going to struggle against the higher AVs but they still take a hull point off 33% of the time - not bad considering you get two shots per weapon. For comparison, a missile launcher only takes a hull point off 50% of the time - and has half the rate of fire. Chuck in the twin-linking options and they're not bad at dropping flyers either - takes a lot of them to do so but lots of shots and re-rolling all dice for 6's is about the best you can do without flyers of your own. Autocannons also get the most out of snap firing due to their increased rate of fire - if the infantry have to move they have a higher chance of doing some damage if they aren't running as well. Missile Launchers are still the jack of all trades with their small blast and high strength single shot but with the changes to the vehicle damage chart and missile launchers being a single shot, AP3 weapon, they are no longer as effective at destroying vehicles. They are still decent at suppression due to their higher strength and when push comes to shove, they can pack some wounds on infantry as well but their general utility as an anti-vehicle weapon has gone down. However, if in the future an FAQ comes to play allowing some (or all) missile launchers across armies having Flakk missiles (a missile which has Skyfire), missiles will re-emphasis their jack of all trades card and still be a good middle ground choice which can do a little bit of everything. The lascannon is the next obvious choice - generally maligned in the past for being too expensive and not gaining anything of particular note against vehicles, Lascannons are now an improved option RELATIVELY speaking compared to other weapons thanks to AP2. This basically keeps the lascannon on par with what its damage capacity was before but with reduced cover saves it becomes slightly more effective. The other options are much more restricted in their use. Heavy bolters have seen improvement in being more capable of destroying vehicles thanks to hull points but they still aren't a heavy weapon of choice. Just the occasional times you have heavy bolters (i.e. Dakka Preds, hullmounts, Typhoons, etc.) they are more useful. Mortars for Imperial Guard are a bit more plausible as options with their ability to snipe models from far away. It's unreliable though and is still just S4 wounds but its some utilty. Plasma cannons like-wise got a two-fold buff, they are better at dropping vehicles than before (blasts always count as full strength) and taking off hull points whilst the AP2 blast has to contend with lower cover in general. Multi-meltas are still the star of the show when it comes to taking down tanks and have really lost nothing in their application - when on vehicles or relentless platforms (i.e. Attack Bikes, Speeders, etc.). Multi-meltas on infantry models are far less an appetising proposal and really only fit in certain units (i.e. MM Rhino Bunkers) and snap fire helps them be a little more useful on the turns they need to move. Still a fantastic weapon on other platforms though. Special weapons were a little less varried than heavies in 5th edition. Meltaguns was generally the first and last option people reached for - it was the best way to drop tanks and dirt cheap. Things haven't really changed with the meltagun itself. It's still the most potent anti-tank vehicle when everything works in it's favor; it still bypasses most armor values at close range and has a 50% chance to destroy a vehicle when it penetrates and it's still dirt cheap. Chuck in a general reduction in cover (specifically, man-made cover like smoke launchers) and meltaguns are arugably better than they were. Unfortunately though, the most common platform for them, infantry inside transports, have had their threat ranges reduced by ~3" thanks to the new disembarkation rules. This threat range loss is of course gained only at the extreme and often would put such infantry in a place to get blasted to bits next turn (aka over-extension) but this option is now hindered just that bit more. Furthermore, the 3" lost still leaves the current infantry squad exposed as they must disembark and then move 6" - you can no longer move the transport 12" and disembark behind it to gain some protection. Expect to see these mostly on mobile units (i.e. jump infantry, bikes, etc.) though taking them in transports isn't bad, it's just not as flexible as in the previous edition. The big change of 6th edition is of course the potential for the plasma gun to become much more popular. With a reduction in cover and changes to rapid fire weapons, the low AP of the plasma gun can come into play more often (forcing multiple 5+ cover saves is a lot better than multiple 4+ cover saves) whilst the rapid fire changes allow the plasma gun to have an effective 30" threat range. The addition of hull points to vehicles also make plasma volleys a scarier proposition - consider them a more power autocanno volley at short range. They can take off hull points of lower AVs but thanks to their AP2, they are also a little bit better at actually causing Explodes! results on any penetration they do generate. They are expensive though, but their increased rate of fire makes them effective at both anti-vehicle and anti-infantry duty (though obviously they are inefficient against horde like units). For units replacing their meltaguns with something else, the plasma gun is generally what people will be reaching for. The flamer hasn't changed much - it's always been a bit of a niche weapon on infantry. Like the meltagun it really suffers from the new disembarkation rules and the general weakness of tanks. Throwing a tank forward for some tank shock "I get to move your models" fun is riskier than it used to be and not always worth doing to drop some templates on individuals. That being said, a couple of them in a squad can be killers on Overwatch duty against lightly armed units. Any unit of Orks or Termagants or Guardsmen, etc. isn't going to want to charge (or multi-charge) a squad with a couple flamers in their midst. They're still generally dirt cheap and having a couple in your army for clearing infantry or charge defenses isn't a bad thing but they aren't going to be popping up everywhere. The plasma pistol has everyone jumping up and down currently as well but really, it's the same cost as most plasma guns yet only gets one shot and only at 12". Yes you can take two with gunsliner to effectively have an old rapid-firing plasma gun but it's +30 points. It can certainly be useful as it gets you more raw firepower in a unit already maxed out but it's not exactly efficient. Hand-flamers for Blood Angels though will likely see a bit more use - like flamers they are a niche role but the free Overwatch hits is a pretty decent buy. 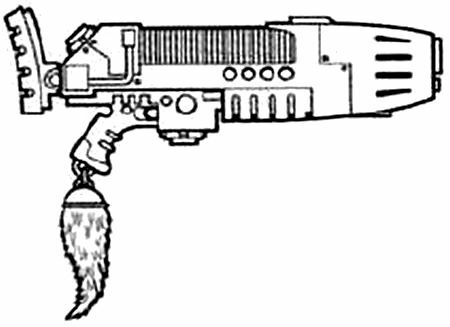 Infernous pistols, also for Blood Angels, are like the meltagun but hit more by the threat range reduction. Again, expect to see them mostly on Jumper units. The three major heavy weapons (autocannon, missile launcher, lascannon) are all still decent choices though I'd say if you had the option for an autocannon, I'd be leaning to them every day of the week over missile launchers. Unless missile launchers do get that skyfire option for an additional cost, well then each of those three heavy weapons does something a little better than the other but neither one is completely over-shadowing the other when compared to their points cost and options where they can be taken. Special weapons are where we are more likely to see a turnaround. Meltaguns are still good but the gap between melta and plasma has closed dramatically and in an edition where AP2 and number of shots matter, the plasma gun is ticking both of those boxes. Expect to see more but not as much as we saw in the LasPlas days of 4th edition.